the poor, the forgotten and the unloved. e live in a time in which tracing ethnic roots has become popular. As we begin a new era of growth it seems appropriate to look back on our origins and who we are today. Simply stated, the roots of St. Mary’s Parish can be discerned in the origins of St. Benedict’s Parish. The very first Eucharistic service in Greensboro dates back to about 1870. Very few Catholic families lived in the area at that time and Mass was celebrated periodically in the homes of these pioneering people. 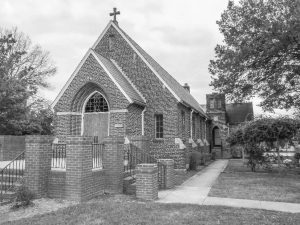 In 1877, Bishop John Gibbons of Richmond, Virginia, laid the cornerstone of St. Agnes’ Church – later renamed St. Benedict’s in tribute to the Benedictine Fathers who served the spiritual needs of the Catholic community in Greensboro. St. Agnes Church was sold to the city in 1899 and became the first city high school. A new lot was purchased on the southwest corner of North Elm and Smith Streets where the present edifice was constructed. The number of black converts in the community grew and the year 1928 marked the beginning of St. Mary’s Parish to serve the black residents of southeast Greensboro. Through the efforts of Greensboro Attorney Robert Douglas, four acres of land on the corner of Duke and Gorrell Streets were purchased from the Benbow estate. Work began on the new mission church/school building on June 15, 1928, under the direction of the Reverend Charles Hannigan, S.S.J., a pioneer missionary in North Carolina. The Most Reverend William Hafey, Bishop of Raleigh, asked the Daughters of Charity of St. Vincent de Paul at Emmitsburg, Maryland, who at that time staffed St. Leo’s Hospital in Greensboro, to staff the school for the black children in the eastern section of the city as well. The Daughters of Charity sent three sisters who began the teaching apostolate in September 1928. The first Mass was celebrated September 16, 1928, in the present Parish Center. This is the background of St. Mary’s Mission which in 1928 became a separate entity to serve the spiritual needs of the blacks in the Greensboro area. In 1948, the name of the parish was changed to Our Lady of the Miraculous Medal. Our Lady of the Miraculous Medal School provided outstanding education based on sound pedagogy and solid religious training for forty-four years. In June 1972 after much prayer and consideration, the parish school, reduced in numbers to just 72 students was closed. The Diocese of Raleigh was divided in 1972 and the Most Reverend Michael J. Begley was installed as Bishop of the new Diocese of Charlotte. In that same year the name of the parish reverted to St. Mary’s. The process of integration continued to evolve and October 1973 marked the establishment of parish boundaries officially changing St. Mary’s from its traditional role as a black parish into a territorial parish. The 1970’s ushered in a new phase in the life of St. Mary’s as refugees from Asia and Africa began to join the parish. Diversity is one of our greatest strengths. In the mid 1990’s another phase in our parish life began with the migration of Latinos, mainly from Mexico, began worshiping at St. Mary’s. Prior to that time there was only one Spanish language Mass, celebrated monthly, in Greensboro. Through the efforts of Father Vincent Finnerty, C.M., a weekly Mass in Spanish was instituted in 1995 and continues to the present. Currently, our parish is comprised of African American, White, Vietnamese, Latino and exiles from civil wars in various nations. We have parishioners from twenty-one countries and from every continent except Australia and Antarctica. Today we look forward to serving God and his people with expanded facilities and a new era of growth. Although a poor parish in financial terms, with confidence in the help of God and our parishioners, benefactors and friends, we constructed and began using our new Parish Center in September 2003.